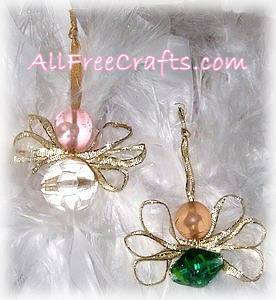 Craft a beaded angel with nothing more than two beads and a little wire-edged ribbon! These bead angels are easy and quick to make, but they make a lovely gift that is symbolic of love and caring. We’ve created some special printables to go with your bead angels – blank gift tags in two sizes, or a printable Angel Psalm Scroll. One little angel looks lovely in a tiny gift box, nestled against a bed of white feathers or artificial snow. You could also line a small jewellery sized box with felt, batting or even flattened cotton balls, add a sprinkle of glitter, and lie the angel on top. Print out the Guardian Angel Psalm, roll it into a scroll, tie with more ribbon, and place it beside the angel. Note: Ideally, the holes in both beads will be large enough to thread with a double-thickness of the ribbon used for the wings. If not, use fishing line, quilting thread or other strong sewing thread, in a color that coordinates with your beads, to fasten the beads and wings together. 1. Fold a length of thin, wire-edged gold ribbon to make the wings. Fold the ribbon in a zig-zag, or accordian pattern, so that you have three folded loops on either side. The two ends should be cut where they just pass the middle point. Thread the ribbon through the bottom bead bringing both ends up equally, one on each side, to the top center of the bead. Knot together at this spot. Place the wings on top of the knot, and knot again, tying the wings in place around the center. Thread both ends of the ribbon through the hole of the top bead; knot to secure as a hanger. 3. Unfold the wings using the photo as a guide. 4. If desired, print the angel scroll or the matching free printable gift tags, all shown above. You may also choose to Print Two Angel Scrolls and Four Angel Gift Tags all on one page, and there is also a new printable scroll available on the Angel Buttons page.